Ad has specialized in Reinforced Paperboard Binders. We design and manufacture the highest quality Paperboard Binders available and our binders will make your brand or program stand out from all the rest. Our Reinforced Paperboard Binders are SFI certified and completely eco-friendly. Our Paperboard Binders are more durable than most because of our complete reinforced edges. We can customize with business card slits and pockets. For extra durability film lamination may be added. Call, email or chat with us for more details. Reinforced paperboard binders is one of Ad Industries’ specialty products. 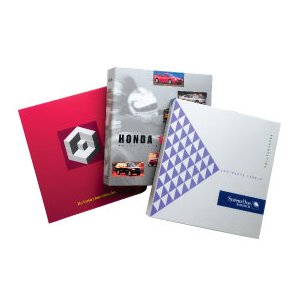 Our paperboard binders are the perfect products to use when you are looking for custom solutions to market your brand. We design and manufacture the highest quality paperboard binders available, and we guarantee that your brand or program will stand out from all the rest. At Ad Industries, we ensure that our binders meet all your requirements in terms of design, strength, aesthetics, and longevity. Our paperboard binders are more durable because of our complete edge glued reinforced edges. We can also provide customized graphics enhance the marketability of your brand with this inexpensive option. We print the artwork on the cover sheet and then reinforce it with lamination. The film lamination provides extra durability. Four-color process and digital printing machines allow our customers to take advantage of the best decorating techniques available. The four-color printing process (CMYK) enables printing of an accurate, detailed product with vibrant colors, which grabs the client attention and makes your brand distinct and unforgettable. For digital printing, we utilize the most up to date equipment available Epson, Xerox IGen. Using these systems increases the quality of the graphics, and text in terms of sharpness, clarity, and consistency. We also provide custom binders to meet your personalized needs. Ad Industries’ standard and custom reinforced paperboard binders are SFI certified and completely eco-friendly. We can customize the binders with business card slits and pockets. Our paperboard binders are known to exceed client expectations as durable, solution driven marketing Contact us to know more.